In today’s Instagram crazy and photo ready world, it is important to have a great digital camera that can adequately capture those memorable moments. Many of the phone cameras that are made today are very good. However, with digital cameras such as the Pentax Ks2, you will have all the right features for a top-notch image. With its image, ISO and custom settings, you can experiment with your shots and produce some phenomenal pictures. If you are a professional photographer, then it is doubly important that you have a great camera. Especially, because doing so will protect your brand reputation and bring repeat customers. This is certainly good for business. With all the various digital cameras on the market, it can be difficult when you are trying to decide on which brand, model, or type is right for you. To help, we reviewed the Pentax Ks2. As you continue to read through the article, you will learn about some of its key features, as well as the pros and cons of this camera. Typically, second generation products hold to many of the existing features of their predecessor and incorporate a few old features. But not the Ks2, it has a suite of changes that any user can appreciate. The Pentax Ks2 is an artist’s camera. It is designed on the foundation of the great SLRs. Ks2 is the premier DSLR, which has Wi-Fi connectivity, thanks to Ricoh Imaging. As such, you will be able to share your pictures readily on the internet or to your social media accounts. This feature will also allow you to upload your images seamless to the cloud and have quick browsing on your remote tablet or PC. Thanks to the 20 megapixel, AA Filter-less CMOS sensor with Prime MII, your camera will produce awesomely sharp images. There is also an innovative retractable customary zoom feature included. The especially slender, weather resistant lens goes flawlessly with the solid casing of the Pentax Ks2. This provides a sophisticated effortlessness for transporting the device. The Ks2 model also comes with a "selfie" button that allows the photographer to include himself or herself effortlessly, in the picture. So rest assured, with the Pentax Ks2, you could take captivating pictures and then quickly make them available. While there are some similarities, the Pentax Ks2 does not closely resemble its predecessor, the Ks1. One of the first major changes that we noticed was to the external frame of the camera. But, the camera manufacturers kept the 20 million-pixel CMOS mechanism. However, it does not have the anti-aliasing filter. Enthusiasts will probably appreciate these changes. The previous flashing lights, which were originally apart of the Ks1 are gone. It now comes with a premier fully articulating rear LCD screen that is weather resistant. The Pentax Ks2 model is a standout camera that separates itself from others because of its dual control wheels, 100%-coverage viewfinder and weather-sealing components. It competes sufficiently with other cameras in its category. We also noticed that there is an HDMI output for the Ks2, in place of the original wired remote port that can be found in the K-50 cameras. In addition, the Pentax Ks2 does not work with an AA battery adapter, which was also previously a feature of the K-50 cameras. 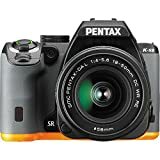 Incorporating NFC communication and Wi-Fi connectivity is also another bold technological change for this Pentax camera model. There is also the ability to sync the camera with a phone app or an application on a tablet that provides for quick sharing, transferring the images and remote control access. Another feature that adds value to the camera package is the 18-50mm f/4-5.6 lens, which pulls back. So this does not hamper any body movements, while it is being carried around. We also found a new kit lens that is integrated in the camera. Additional features include the pentaprism viewfinder, which is 100% optical, ISO sensitivity of 51200 and complete HD video recording. The Pentax K-S2 is sold for approximately $629.95. This is excluding all the kit options. You can view available items on Amazon. The fact that the new kit lens is retractable enhances the smallness of the camera. You will not have any difficulty trying to fit it in a camera bag or carrying case, because of its slim design. Conversely, this does mean that you have to extend the lens before you can take a picture. In the case that you need to take quick shots, you have to leave it extended. Another advantage is that there are quite a few K-mount lenses, on the market, that will suit this Pentax Ks2 camera. Comparably, the size of the camera is similar to the Olympus or Panasonic camera and not the Nikon and Canon DSLR cameras, with which it competes. It does not compare, when it comes to the grip. Its competitors have a deeper grip. But it is still a good camera when you look at all its other features. A miniature niche will allow your middle finger to rest easily, at the same time as your forefinger relaxes as expected on the shutter release and even on the front-scrolling dial. At the rear of the camera, there is also a miniature niche for your thumb as well. So in general, your hand is well accommodated for holding the device. On the right-hand side of the camera is where you will find many of the Pentax K-S2’s buttons. So you can naturally maneuver any of the features with just that hand. However, on the left side of the viewfinder, is where the Live View button is now located. The RAW/FX button and the AF/MF switch are located on the side of the camera. You change the customization settings to any of six special functions as soon as you engage shooting mode. Automatically, this button permits you to change between raw format shooting and JPEG, by simply engaging the button. When you take a picture and review it on the camera, you can tell that your images are showing first-class color, warmth, and vibrancy. If the displayed image is not to your preference, then you can use the Custom Image setting, to experiment with the color. There are many options for you to select. These include Radiant, Neutral, Bright, Vibrant and others. There are the highly creative choices including Reversal Film, Bleach Bypass and Monochrome. But, the best thing about it is that you can take raw pictures and keep copies separate of those you edited. Toy Camera or Invert Color is different digital filters that you can test. You can consider them a bit more intense than other settings. People who prefer a more creative handle on their pictures will love this feature. In addition, the Pentax Ks2 has taken care of some level of detail that is resolved by the AA-filter less 20-million pixel sensor. When we examine a picture at full size on the lowest sensitivity, there is barely any amount of image smoothing that is noticeable. This is a welcome change. Whilst we were utilizing the high settings, for example ISO 3200, there was retention to detail as well. In addition, we generally expect that at the higher levels of sensitivity, there will be a degree of noise, which increases as you go. But, the application of the image smoothing, makes certain that it does not overly detract from the quality of the shot. The all-purpose metering system adjusts well to create perfect exposures. In a few high contrast situations, you may need to add some amount of extra exposure as compensation. A minor concern is that whilst using the kit lens, there is a possibility that you could see a bit of purple fringing the length of high contrast edges. This is a recurring concern that we have with the Pentax cameras. And even if it is not happening all the time, it is unsatisfactory to witness it at all. Photographers, whether novice or professional, can rest assured that this is a good camera. Even though most people prefer the ever-popular Nikon and Cannon cameras, this Pentax model, can hold up to the competition. It is good to try out other brands, like this because you realize that models such as the Pentax Ks2 give you great images and flexibility to be creative. Taking into consideration, how much it costs, this camera comes packed with top class features. And that is not typical. The fact that it is water resistant, makes us comfortable in operating the device in most weather conditions - even in the pouring rain. And you do not have to worry about damaging the inner components of the camera. The compactness of the camera is also a great feature. You can store it comfortably and carry it around easily without protruding parts getting in the way. The retractable lens allows you to hold the device capably, even if you have to retract it when the time comes to use the device. But, if you are going to need to take quick shots, leave the lens un-retracted. So, people who prefer a lighter camera, with the same features as the Canon or Nikon, might prefer the Pentax Ks2. It has a natural feel when you are manipulating the camera in your hand. The various resets and grip, makes it handy. The placement of the buttons on the right and to the side is helpful as well. A right-hander will have no problem using one hand to navigate the features. For photographers who always find themselves trying to get a shot from an awkward handle, the articulating screen is a great addition. There is no difficulty in setting up the integrated Wi-Fi and the accompaniment of a Smartphone app is truly helpful and modern. Certainly, we find that it is better than the Nikon Wireless Utility App. If you are in low light, this camera still gives great shots. The overall image quality is good when compared to other cameras. And with the automatic metering and white balance modes, a novice can depend on not being too frustrated with navigating a bunch of unfamiliar settings. A professional would definitely not be put off by the camera. There are so many highly rated features. It allows you to go from being mildly creative to engaging in great photography risks, whichever suit your tastes. All of this is possible because of the many custom image modes. And as we mentioned, the one drawback is the purple fringing that can occur and detract from the image quality when using the custom settings at high sensitivity. Overall, the Pentax Ks2 camera is an especially proficient device. It ought to give many enthusiasts great pleasure and reassurance. This is most of all true for anyone who does not have a fastidious preference for any of the trendy cameras, like Nikon and Canon that are pricey. The Pentax Ks2 camera is an especially proficient device. Its retractable lens and slim design makes it easier to carry and can fit in almost camera bag or carrying case. If you don't prefer the displayed image, you may use the Custom Image setting, to experiment with the color. Next articleReview of the Pentax K-S2: Is it Worth Your Money?